Bible Cartoons: Elijah blown about on Mount Horeb! Elijah blown about on Mount Horeb! Poor old Elijah the prophet – battered by divine wind storm, earthquake and fire! 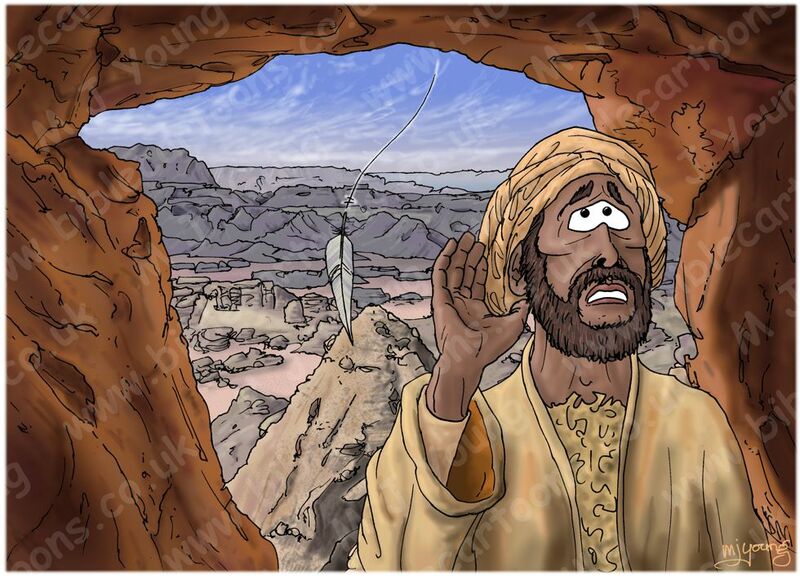 I’ve just completed the final scene in the set of Bible Cartoons that illustrate the exciting story of the Old Testament prophet Elijah’s trip from Israel to mount Horeb, and his encounter with the Living God on that lonely mountain. The Lord shows Elijah a violent wind storm first, with gusts that shatter rocks… but the Lord was not in the wind storm. Next the earth quakes, with more rocks splitting… but the Lord was not in the wind storm. Next a huge fire storm sweeps over the rocks… but the Lord was not in the wind storm. Lastly there is a gentle whisper – the voice of the Lord. On hearing this, Elijah covers his face and goes out of the cave he was hiding in. Then the Lord speaks to Elijah. I don’t know if these mighty visual manifestations of the Lord occurred as apocalyptic visions in Elijah’s mind, or as actual, physical events on the mountain. In either case, he was convinced that he had met the Living God, so it probably doesn’t matter. In any case, Elijah is reassured and returns to Israel, to anoint the three men God directs him to, in 1 Kings 19:15-18  which culminates in the calling of Elisha, the prophet who will replace Elijah.